For the latest Red Barn events, please see The Friends of the Red Barn's Events page on Facebook. For the latest Red Barn news, please see the News page. 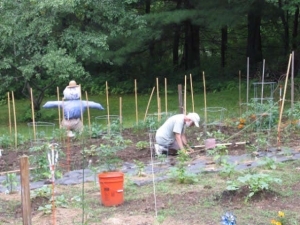 Yearning to have a vegetable garden? The $75.00 fee includes a $40.00 garden fee, plus a $35.00 Friends of the Red Barn membership fee. If you are already a member at the $35.00 level, your garden fee will be $40.00. We invite you to learn about the Red Barn and The Friends of the Red Barn. You can use the menu at the left of each page to explore our Website. Learn about The Friends of the Red Barn. Learn about the historic Red Barn. Stay up to date with the latest news about the Red Barn. Join The Friends of the Red Barn and help to support this historical landmark and the fun, educational community activities and events that The Friends of the Red Barn hold throughout the year. Get involved! Help maintain and beautify the Red Barn. Help out at Red Barn events. There are lots of volunteer opportunities and ways to help! The Friends of the Red Barn would like to thank the people and businesses in our community that provide help and generous support for the Red Barn and Red Barn events! If you have any questions, or if you would like to find out about joining The Friends of the Red Barn, participating in any Red Barn activities, or volunteering at any of the Red Barn events, please contact us! We look forward to hearing from you!